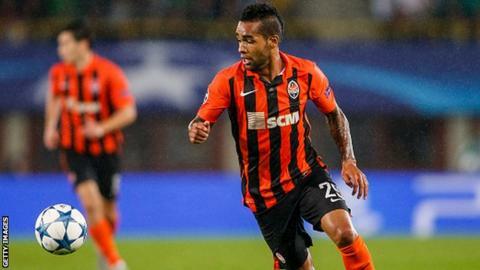 Shakhtar Donetsk forward Alex Teixeira says he is frustrated his move to Liverpool is yet to go through. The Reds have offered £24.5m for the Brazilian but his Ukrainian club are believed to looking for about £39m. Reds boss Jurgen Klopp wants to boost his striking options, with Danny Ings, Divock Origi and Daniel Sturridge injured. "Liverpool are a huge club. So many great players have passed through there," said Teixeira, 26. With £32.5m summer signing Christian Benteke yet to consistently impress, Liverpool have only scored 30 goals in 23 Premier League games this season. Shakhtar are at a winter training camp in Florida, but striker Teixeira has scored 22 goals in 15 league games for them already. In an online interview, Teixeira said he had not given up hope of linking up with countrymen Philippe Coutinho, Lucas and Roberto Firmino at Anfield before the transfer deadline on Monday. "I want to be there. But that is up to the club president now. I can only hope," he added. "It is frustrating. So now I'm just waiting, trying to be patient. "I've played with Coutinho since we were 10-years-old. It would be a lot of fun to play with him again. "I am always looking to score. I could definitely add an attacking threat, especially if I'm paired with all of the talented players they already have in the squad." Find all the latest football transfers on our dedicated transfer page.